A vibrant paradise in the Asian subcontinent, Malaysia is the land of cultural diversity, breathtaking beaches, and urban wonders. A visit to this country is a must on the itinerary of every avid traveller. And now, reaching this fabulous land just got easier with the introduction of the e Visa Malaysia. So what exactly is an e Visa? Electronic visa or e Visa is one of the conveniences afforded by modern technology. It is simply a visa that is processed and conveyed through the web. The submission of documents, filling of registration forms, tracking visa status and communication regarding the same, all happen online. Due to the sheer number of tourists visiting Malaysia at any given time, the government has decided to digitize the process of applying for a visa. The Malaysian government issues a travel authorization in electronic format. No stamp on passport is required for an e Visa. Now those interested to pay Malaysia a visit, can do so by simply filling out an application form online and paying the required application fee. Application for the e Visa Malaysia program is a relatively simple process. It can be done from anywhere with an internet connection. The procedure for online registration is straightforward and communication is quick. It cuts bureaucracy, as you can apply for a visa directly with the official Malaysia visa website, or through trustworthy agents. It saves the applicants a long drive to visa consulates and puts an end to standing in those never-ending queues. Also, applying for an e Visa doesn’t burn a hole in your pocket. The visa fee of Indian citizens has been waived off by the Government of Malaysia if they apply for an eNTRI visa of 15 days. Only a processing fee of 20 USD is charged. Who is eligible for an e Visa? Apart from this list, it must be noted that the e Visa Malaysia is applicable for only tourist and visit visas. Those seeking employment visas, work permits and dependant passes need to apply through the conventional route and cannot apply for an e Visa. The types of visa you can be obtained through online registration are, Electronic Travel Registration and Information (eNTRI) visa, Single Entry e Visa and Multiple Entry e Visa. All three types of visas are valid for three months from the date of issue. The visas can be obtained after payment of processing fees as explained. eNTRI visa is an abbreviation for Electronic Travel Registration and Information Visa. It’s an initiative launched by the Malay government to felicitate relationships with China and India. It is available only for the citizens of these two countries. 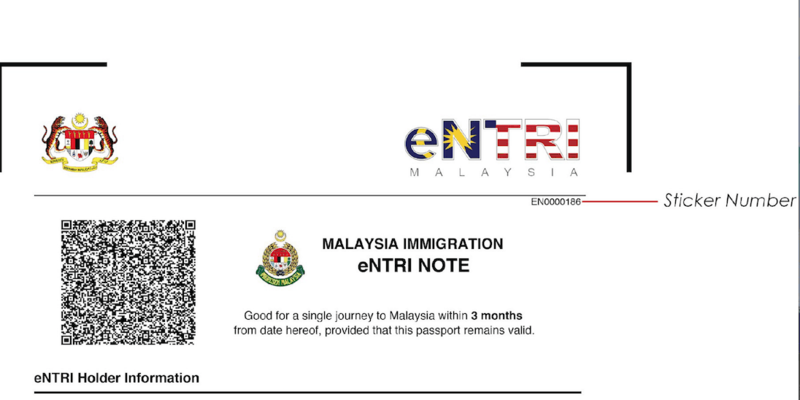 An eNTRI visa needs to be obtained 48 hours before departure to Malaysia and is a single-entry visa only (a re-application is necessary the next time you visit). Single entry visa allows you to stay in Malaysia for a 30-day period. This visa is issued to foreign nationals that are looking to visit Malaysia for a social visit. However, this 30-day period is not extendable. A re-application for eVisa must be made after the valid period is over, as the individual cannot enter Malaysia with the same visa again. Multiple entry visas allow an individual to visit Malaysia, without the need for re-application of visa each time. However, the individual can enter the country only between the time period of 30 days and can stay in the country for the same duration. An extension of the 30 days time period is not allowed. With a lot of scam companies duping travellers of their money, it is essential to pick online agents who are trustworthy. Evisamalaysia.in and windowmalaysia.my are two notable sites that are trustworthy and offer the best experience. The site windowmalaysia.my is the official Malay government site for visa bookings, however, the site is prone to frequent crashes and is often slow. The alternative is evisamalaysia.in which offers a safe and simple visa booking experience. In the next section, we will detail the documents required and the application process for an e Visa to Malaysia – both through a trustworthy agent we recommend as well as when using the official Government of Malaysia portal. Colour front page photocopy of passport. Please note that the passport must be valid for 6 months minimum at the time you apply for e Visa. Confirmed return tickets back to your home country before visa validity expires. 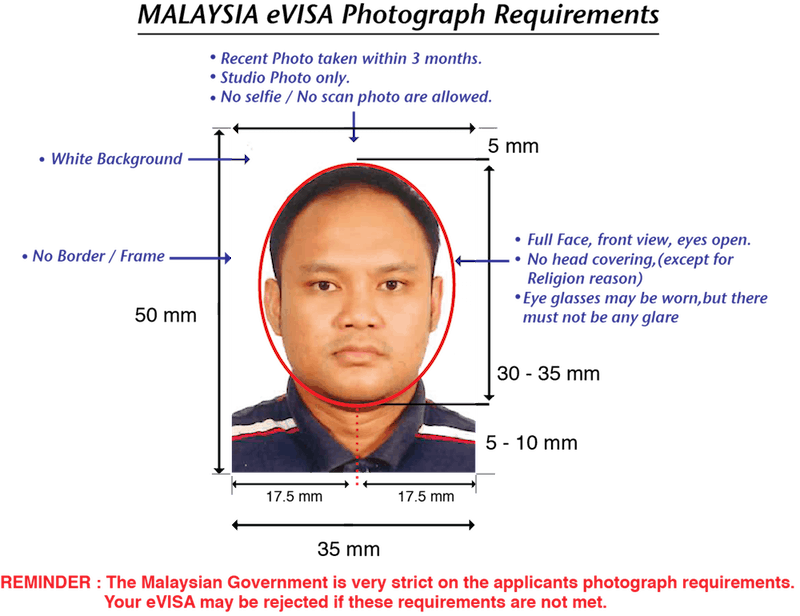 Passport size photo in the format approved by the Malaysian government. Face should be visible, and eyes should be open. Go to the website evisamalaysia.in and click on ‘Apply for Malaysia e Visa’. You can also follow this link. Fill in your details and select the type of visa that you require. If there is any confusion regarding the selection of visa, you can contact their agents. After the online registration form is submitted the agents will contact you to explain the process of e Visa Malaysia verification. The payment of processing fee needs to be made after you receive a confirmatory email. The processing fee amounts to 10 percent of the visa fee. Track your visa status and track your online application by staying in regular touch with the agents. You can also choose to receive phone and SMS updates. Once the visa is verified and approved, an email will be sent to you regarding the success of the same. The visa is processed in a 48 hours period. (The 48 hours period does not include weekends and public holidays. The processing period may also be extended due to unforeseen reasons). Go to www.windowmalaysia.my and click on ‘Apply online’. Alternatively, you can follow the link given here. Click on the ‘I’m New’ tab. If you wish to review your application or track your visa status, click on ‘Returning User’ instead. Fill in the registration form with correct details as mentioned in your passport. If you are applying directly to the government website, without the help of agents, you might be subject to more stringent checks. The site windowmalaysia.my is the official government website formulated for visa processing. The parameters for submission of documents and filling of the registration forms is, therefore very strict. The processing fee once paid is non-refundable in case the visa is rejected. There have been many instances where the visa applications have been rejected due to small errors, such as incorrect formatting for photo and spelling errors in the registration form. It is recommended that you apply through the website evisamalaysia.in. For a negligible fee, the agents will apply for the visa on your behalf with careful consideration. You can verify the status of your e Visa application by following the link given here. After you have submitted the details, you will be redirected to a site confirming the status of your application. If your visa is approved, you will get be able to see your details, with the application and validity status as shown below. After you have arrived at the Immigration checkpoint you will be asked to provide the following documents. It is important to note that entry into Malaysia will be provided at the discretion of the Immigration Department. You might be refused entry even with a valid visa. Yes. An Indian citizen is required to have a visa before travelling to Malaysia. Visa can be easily obtained by applying for e Visa through evisamalaysia.in. However, Visa for expatriation and employment reasons need approval from the Immigration Department of Malaysia and cannot be applied online. How many days do I need to wait to get my tourist Visa? e Visas for Malaysia are very quick, and will probably reach you after verification and approval, in about 2-4 days. This does not apply if the days are weekends or public holidays. The visa might be delayed due to server errors or other unforeseen issues, but will reach you in no less than a week at the most. How much does a tourist visa cost? The cost for different e Visa varies for the types of visa you require. Can I apply for visa on arrival for Malaysia? Only Indian and Chinese citizens are eligible for visa on arrival in Malaysia. However certain conditions need to be met before the visa on arrival can be approved. Visa on entry is only allowed if you enter from either Singapore, Thailand or Indonesia. You are obliged to already have a valid tourist visa for either of these countries. Visa on arrival is a single-entry visa. The visa on arrival will be valid for only 7 days and is not extendable. What happens if the e Visa expires before we leave Malaysia? e Visa Malaysia is valid for only 15 days if it’s an eNTRI visa and for 30 days if the visa is Single entry Visa. If you do not depart Malaysia after the validity of visa is over, then you will be charged by the Malaysian authorities and forced to pay fines. It is also possible, that the next time you chose to apply for a Malaysian visa, it will be denied by the Immigration department. What payment method do I need to use to pay the processing fee for e Visa? The payment for e Visa application can be made through credit card, Paypal or online banking methods. I’m not able to access the e Visa application page or website? If you’re using the government site, it is prone to crashing and sluggishness due to traffic. Try applying through evisamalaysia.in, a trusted agent for e Visa Malaysia applications. Try accessing the site from a different browser, like Chrome or Firefox. Clear your computer’s cookies and cache. Can a minor apply for the e Visa? In case of a minor, the e Visa application must be filled by a guardian. If the minor is below 12 years old, a Birth Certificate is mandatory to apply for the e Visa. However, if the minor is travelling alone, a NOC (No Objection Certificate) is necessary from both parents and a copy of both their passports might be necessary.